The morning was stunning and perfect for a short 4 hour trip on McFire. 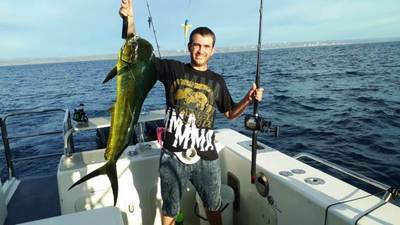 Once warm blue water was found it was not very long before the first reel sang and there was a nice Dorado on board. It soon after there was a Yellowfin Tuna on board. Once back in the greener water things went quiet and it was time to head for port. Sometimes a short trip is all one needs to just get out there breath in some fresh air in and get some quick fishing in, then head back de-stressed and refreshed.